What would happen if the groundhog instead of being scared of his shadow on a sunny day, basked in its warmth? 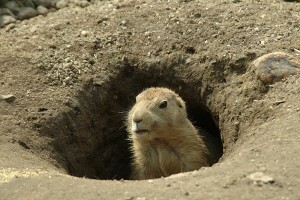 On February 2 every year, Groundhog Pauxitawny Phil comes out of his hole. If he sees’s his shadow, he gets scared and goes back into his hole. Folklore has it there is then six more weeks of hard winter. It got me thinking about the fears of our shadow side. When we focus on our shadows, things do in fact get emotionally colder. All of us have a shadow side – those things of which we are not proud and, in fact, can scare not only us but others as well. When project team members get stuck in the shadows, project progress can go into the deep freeze. But let’s consider this, what if the groundhog when he sees his shadow on a sunny February 2nd focuses on the warmth of the sun rather than his shadow? The sun, in fact, does shine the same on everyone – it is our choice whether we fixate on the light or the shadow this brightness casts. It’s also our choice if we focus on people’s kindness, their strengths, and where they shine. When project team members make it their practice to leverage each other’s strengths – project progress is more likely to move along at a good clip. And this is what Cheetah students learn how to do when they take Cheetah’s online 60 hours Personality Based Project Management. They identify how their innate strengths help them learn better, do projects better and relate better to others rather than being unprepared to best use their talents. They also learn how to bring out the best of their project team members. You can create a brighter future for yourself simply by focusing more where things are sunny and warm with your life rather than on your shadows. Granted an awareness of the pitfalls is helpful. What is not helpful is a perpetual rumination about what scares you. Many people are scared about doing what it takes to become Project Management Professional certified. When you go to a market leader in accelerated exam prep – Cheetah Learning, you become smart, not scared. Download Cheetah’s Smart Start Guide for the PMP. This entry was posted on Tuesday, February 2nd, 2016 at 8:00 am	and is filed under High Performing Business. You can follow any responses to this entry through the RSS 2.0 feed. Both comments and pings are currently closed.